Protected content club was inaugurated in June Protected content , creating a new revolutionary concept in the field of nightlife in the city of Barcelona. It is settled in an old textil factory on Protected content Its initial structure of two floors with mezznines, recreated the typical New York industrial environment, based on open sapces decorated with hard materioals, cment, cast iron pillars, metal bars, iron beams and ceilings vaulted of mahón. 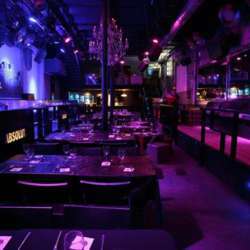 It is an authentic factory of fun and glamour in the middle of the city. It's a must! Protected content is a common favorite nightspot amongst intenational people and locals. Perfect for InterNations members and friends.